Medical Science Educator is the successor of the journal JIAMSE. It is the peer-reviewed publication of the International Association of Medical Science Educators (IAMSE). The Journal offers all who teach in healthcare the most current information to succeed in their task by publishing scholarly activities, opinions, and resources in medical science education. Published articles focus on teaching the sciences fundamental to modern medicine and health, and include basic science education, clinical teaching, and the use of modern education technologies. 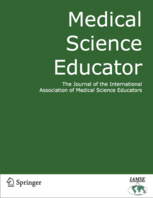 The Journal provides the readership a better understanding of teaching and learning techniques in order to advance medical science education. More information can be found at the journals homepage www.medicalscienceeducator.org. To download a flyer for Medical Science Educator, click here. This page refers to the volumes 1 - 20 of the online journal of IAMSE until 2010. In that period the journal was named Basic Science Educator and later on JIAMSE. These issues are freely available. If you look for journal issues from 2011 or later, under the name of Medical Science Educator, please login to the member-only area of the IAMSE website to access that content. Medical Science Educator is published by Springer.